International Journal of Research in Health Sciences,2014,2,3,776-782. 1-Senior Resident, Department of Orthopaedics, Dr. DY Patil Medical College and Hospital, Nerul, Navi Mumbai, Maharashtra, INDIA. 2-Professor, Department of Anaesthesia, MGM Medical College and Hospital, Kalamboli, Navi Mumbai, Maharashtra, INDIA. Rationale: Traditionally, reversal of neuromuscular blocking agent is monitored using clinical criteria that is subjective and vary depending upon the anaesthetist’s judgment. There is a need for objective methods of monitoring neuromuscular block. Neuromuscular monitoring permits administration of neuromuscular blockers to obtain optimum muscle relaxation desirable for surgical procedures. Design: The study was carried out in tertiary hospital involving 50 patients undergoing elective neurosurgical procedures, receiving atracurium by syringe infusions for maintenance of General Anaesthesia. The patients were randomized into two groups of 25 each, who were be transferred to the recovery room on the basis of clinical criteria and on the basis of Train –of – four (TOF) Guard monitoring at extubation where the TOF ratio was >0.80 as recommended by Eriksson  in the year 1988 and Viby Mogensen  in the year 1989. 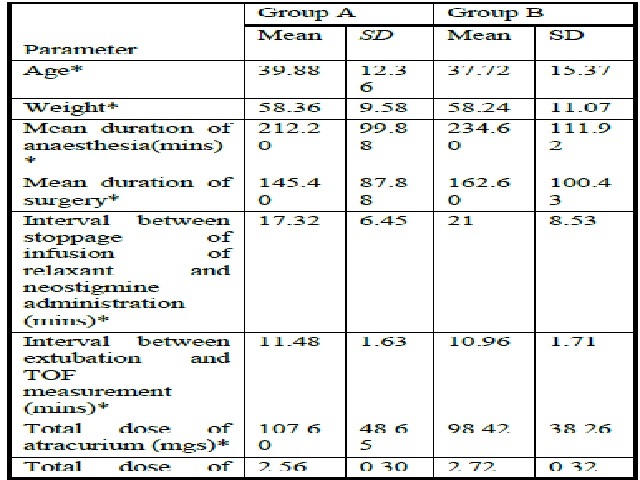 Statistical analysis: The data was analyzed using the unpaired Students t- test as the Test for Significance and Standard Error of Difference between Two Proportions for comparing the number of patients with post- operative residual curarization in the two study groups. Significance was asserted to ‘p’ less than 0.05. Results: The TOF ratio in the recovery room was significantly lower in Group transferred on the basis of Clinical Monitoring (Group A) [Mean 0.791 ± 0.144] compared to Group transferred on the basis TOF Monitoring (GroupB) [Mean 0.877 ± 0.051] indicating a high incidence of PORC in Group A. Conclusion: Monitoring of TOF ratio perioperatively and adequate antagonization of non-depolarising neuromuscular blockade can prevent PORC and its complications.